Out in the remote Western Australian desert a man blows his trumpet at the setting sun. His blues are echoed back to him from the distant mountain range. A rogue dingo also howls his appreciation. This clever dog has been eluding John ‘Dingo’ Anderson (Colin Friels) for some time now. He keeps laying traps but the three-legged dingo has learnt his lesson and sets each one off with a stone. He may be slow but he’s smart, a bit like his human namesake. Flashback twenty years to 1969: young John is interrupted during a game of spin the bottle by the sound of a plane flying low over Poona Flat. His sharp ears are the first to hear it but soon the entire town has relocated to the airstrip to watch the surreal sight of Billy Cross (Miles Davis) and his jazz band descending like aliens onto the tarmac. Their funky impromptu show makes a big impression on John and when Billy tells him to look him up if ever he’s in Paris, the seed of an irrepressible dream is sewn. 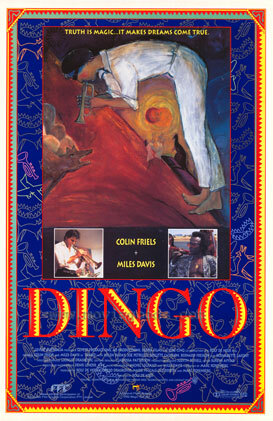 In this eccentric yet engaging film, maverick director Rolf De Heer captured the only screen performance and one of the very last musical performances of the legendary Miles Davis who died that same year. It’s not always easy to understand what he says as he chews his gum with his deep husky voice and his eyes are often shrouded behind big brassy sunglasses. But when he blows his horn it’s pure gold. And Mr Friels makes a good fist of it too as ‘Dingo’, whether playing at the local hall with his less than lively band ‘The Dusters’ or jamming with the best on stage in Paris. I’ll leave it to you to guess where the most appreciative audience was.